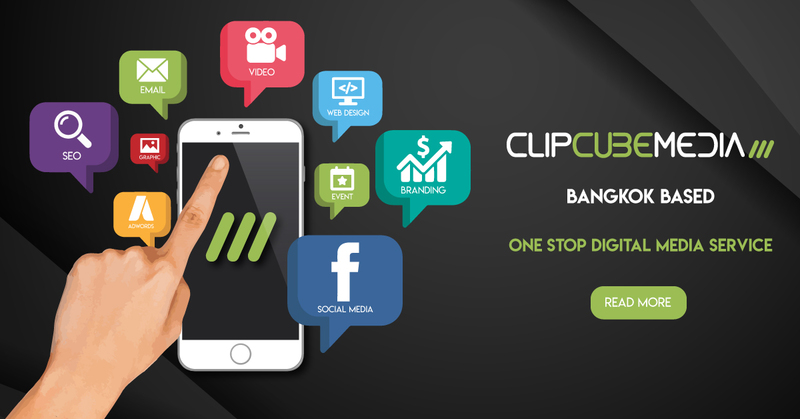 ClipCube Media is a Bangkok-based One Stop Digital Media Service. Video Production and promotion / Photography / Audio and Video Studios, Workspace, and Equipment Rental / Web Design, Support, and Hosting / Social Media Set Up and Management / Newsletter Development and Distribution / Mobile and Web Application Development / Graphic Design, Brochure, Newsletter, Directory Design and Publishing / Event Management and Promotion / Onsite and Offsite SEO / Google Adwords / Brand Consulting and Planning. Services are provided on a project, package or recurring basis and are managed transparently through our online project management system. This allows the client to collaborate and see the progress what is happening when. ClipCube Media has its own inhouse audio and video studios, meeting and viewing facilities in the heart of Bangkok, 5 minutes from Ratchadapisek MRT station, exit 3 and easily accessible at Lardprao Road Soi 38. Contact us for a free consultation to discuss your objectives and requirements.